In the early 2000s, Sporty’s led the aviation industry in transitioning from VHS tapes to DVDs, which offered better video quality and new interactive features. This started the digital video revolution, and was quickly followed by streaming online courses, then native apps for iPads, iPhones, and Android devices. Each of these formats has its pros and cons, and Sporty’s is committed to offering our award-winning video training on as many platforms as possible, from DVDs to laptops to iPhones. You pick which one you prefer. The latest technology trend is a combination of new and old: TV is back. Of course in many ways, TV never went away, but the latest options for smart TVs and video on demand are major advances in technology and they are proving to be more popular than ever. It has never been easier to watch great videos - including aviation ones - from the comfort of your couch. The video quality is fantastic, the setup is almost instant, and you can choose when to watch. A smart TV is really just a high definition screen with some type of internet connectivity built in, often with the option to run specific apps on the TV (much like a mobile phone or tablet). They allow you to watch TV shows and movies without a cable or satellite subscription. There are plenty of options, but the two most popular smart TV platforms are Apple TV and Roku. The Apple TV isn’t really a TV; it’s a small black box that plugs into an existing TV and offers the ability to run channel-specific apps. For example, you can download individual apps that allow you to stream shows from Netflix, watch live sports from ESPN, or rent new release movies from the iTunes store. All you need is a home WiFi network. 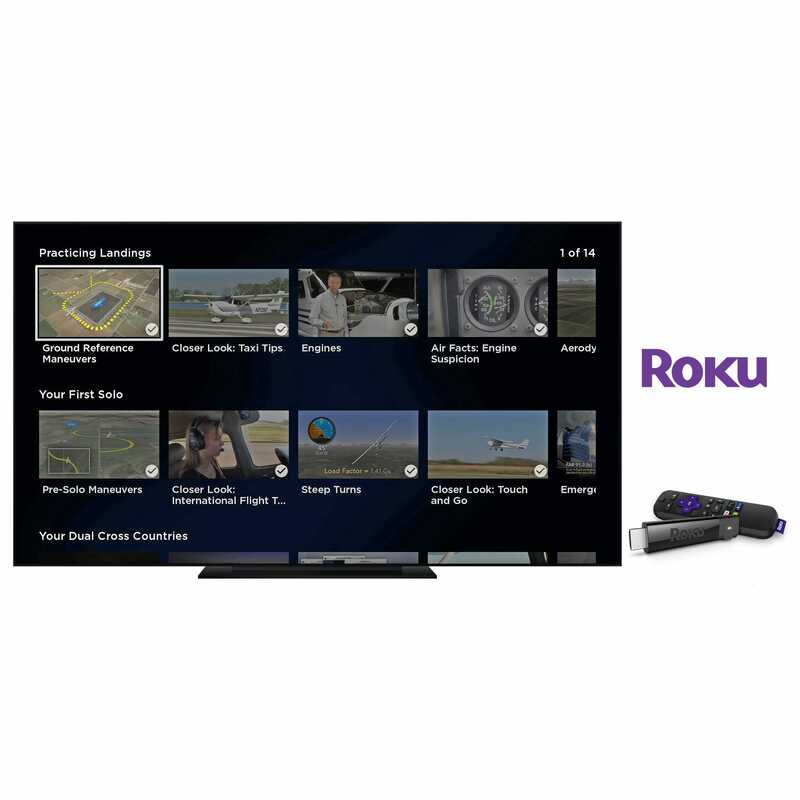 Roku comes in a number of different flavors, from small HDMI sticks that plug into the back of your TV to fully integrated systems built into the latest large-screen TV models. In fact, if you’ve purchased a TV in the last year or two, you very well might have a Roku built in already. The implementation is slightly different from Apple but the idea is the same: add apps (Roku calls them channels) to your home screen and watch videos. In the bad old days, a VHS tape could wear out and even DVDs can scratch, neither of which are a concern with an Apple TV or Roku. Even beyond that, those tapes were out of date the minute they were purchased. No longer - Sporty’s courses are always current on smart TVs. We’re constantly shooting new video and adding new topics to help you fly safer. Now all that new content is available automatically, because updates are included with your purchase of a course. It’s also faster and easier to add new courses. Want to learn more about VFR communications? Just purchase our specific course on that topic at sportys.com, and you’ll see a new course option on your TV. You can watch new videos any time of day, and you can access your courses anywhere you have a smart TV - just sign into your account. Watching Sporty’s courses on a smart TV doesn’t mean you can’t use our iOS and Android apps. In fact, with our automatic cross-platform sync, you can watch videos on your Apple TV, finish them on your iPad, then take practice tests online. Everything syncs so your progress is always up to date. This makes it easy to use whichever format is convenient for you at the time. Sporty’s Pilot Training app is your single source for the best aviation training, on iPad, iPhone, Android, and on your smart TV. The app has a native Apple TV version that offers access to 13 of our most popular flight training courses. Just search the App Store on your Apple TV (4th generation or newer), install the app, then sign into your Sporty’s account to unlock your specific courses. On a Roku device, just search for Sporty’s channel, then add it to your account and sign in. Access to Sporty’s courses on your smart TV is included with your purchase of a course - no additional fees, and no subscriptions. Our goal is to make flight training easier, more fun, and more efficient. Our cross-platform approach is just one example of that commitment.